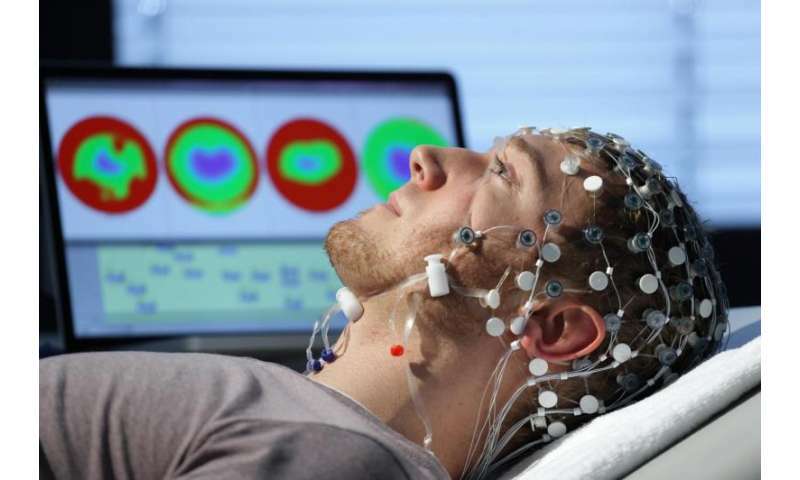 In a new study, scientists from Forschungszentrum Jülich together with partners from the German Aerospace Center (DLR) have investigated the molecular changes with which the human brain reacts to exceptionally long wake phases. The test subjects stayed awake for 52 hours and then had their brains scanned at Jülich's PET Centre. Subsequently, they were taken to DLR in Cologne, where – monitored by the scientists – they were able to catch up on their sleep for 14 hours. Lack of sleep can severely affect our performance and health. 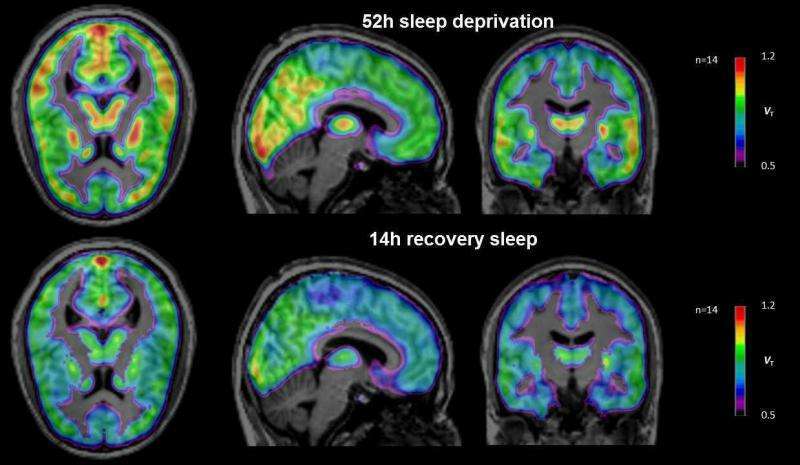 Moreover, a lack of sleep causes changes in the brain which the researchers were able to measure in their experiment. "Our investigations have shown that sleep deprivation increases the number of available A1 adenosine receptors. Thanks to the subsequent sleep phase, they then normalized back to the initial level," reports PD Dr. David Elmenhorst from Jülich's Institute of Neuroscience and Medicine (INM-2). The A1 adenosine receptors are built into the cell wall as a type of receiver. Their function is to forward the signal from adenosine, the docking chemical messenger, to the interior of the cell, where it decreases the cell's activity. It is thought that not only the adenosine itself but also the A1 receptors are responsible for the urge to sleep, which becomes stronger the longer a person stays awake. Adenosine is an elementary product of the energy metabolism. Its concentration varies practically second by second. The number of free receptors, in contrast, changes much more slowly and thus seems better suited for a kind of "sleep memory." The effect of caffeine is also associated with this type of receptor. The stimulant accumulates at complex protein molecules and blocks them. In this series of experiments, the test subjects had to do without coffee and other invigorating substances. During their 52-hour wake phase, they were subjected to several performance tests: pressing buttons to measure their reaction time and memorizing words to determine their memory performance. One striking feature was the individual differences in performance: some of the sleep-deprived participants displayed extreme lapses, sometimes lasting several seconds, while in others a performance drop was hardly measurable. Such a predisposition could be advantageous for jobs in which people regularly have to perform reliably in spite of lacking sleep. "Astonishingly, we did not measure a constant value of A1 receptor density in this seemingly resistant group of test subjects, but a large increase," reports David Elmenhorst. The higher value does not correspond to an exceptionally high concentration of receptor molecules, however, since positron emission tomography (PET) records only a net value. Tracer molecules in the blood stream of the test subjects dock to free receptor molecules and can be observed in the PET scanner when they decay. In this manner, only those receptors are recorded that are not blocked and therefore available at the time of measurement. "Our theory is, therefore, that the test subjects with high A1 receptor density produce relatively little adenosine and thus inhibit the cell activity to a lesser degree," says Elmenhorst. Consequently, the total number of free receptors is higher at the time of the PET measurement. These findings are also of relevance for clinical medicine: sleep deprivation is a quick tool against depression, but only effective for a short time. "There are many efforts to increase the duration of the therapeutic effects of sleep deprivation in the treatment of depression. But the problem so far is that when people sleep again just once they often fall back into their depressed state," says David Elmenhorst. A better understanding of the interrelations between mood and adenosine regulation could thus contribute to optimizing the design of wake therapies.